When you’re just getting started homeschooling a kindergartner, it is easy for a homeschool mom to start off being concerned that her child be on track with their learning. Often she is so concerned that she begins planning full homeschool days covering all subjects, after all if you start teaching Science, History and Geography when they are young won’t it get them ahead? While we should never hold our children back from learning, homeschool moms must also ensure that they don’t push their children too hard…especially when they are young. Kindergartners are so young, a mere 5 years old. They have so much life ahead of them, but because they are young we need to remember that much of their learning needs to happen naturally…often while they are playing! When my children were in Kindergarten I knew that I wanted to focus on the subjects that they would use throughout their lives. Our homeschooling needed to focus on subjects that they needed to know before they could begin to understand topics that we would cover in Science, History, Music, Art, etc. So, when we began our homeschooling journey with my son first, then again a few years later with my daughter, we focused on only 3 subjects throughout their entire Kindergarten year; Phonics, Reading and Math. By focusing on just these few subjects I was ensuring that they also had time to play, rest and just be little. When we add too many subjects and activities to our Kindergartners days we are taking away some of their childhood. Our children need us to allow them to grow up according to their own schedule. Each child matures at their own pace and needs us to give them the time they need to grow up when they are ready. If you’ve read our homeschool journey story, you know that I am a homeschool graduate. Many of the homeschool resources and curricula that I’ve used with my children were used by my mother for my brothers and I. I believe that if a homeschool curricula can stand the test of time with proven positive results that there is no reason to reinvent the wheel. I would much rather use a homeschool resource that has been around for ages, that homeschool moms have used successfully than try out the latest and greatest with little recommendation. That being said, there have been several newer homeschool resources and curricula that I’ve used with my children and loved, like the best math curriculum for non-mathematicians and this non-artistic mom’s favorite elementary art curriculum. 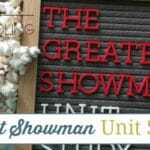 However, before trying a new homeschool curriculum or resource I tend to try using the resources that have been known and loved for many years. For our Kindergarten homeschooling journey we used the same Phonics and Reading programs that my mother used. I decided to stick with these homeschool curricula because I know that they work well, because my brothers and I are all avid readers and writers. While none of us ever planned to write in anyway, as adults my oldest brother and I both enjoy writing poetry and my younger brother writes lyrics and fictional stories. 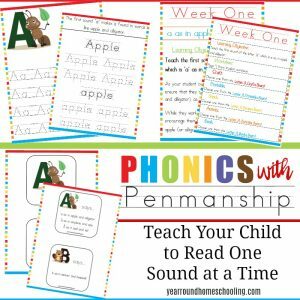 My favorite phonics curriculum for Kindergarten is one that I created, Phonics with Penmanship. There are two full year programs designed to prepare your children to learn to read. This curriculum will guide and enable you to teach your children to recognize and write the letters of the alphabet while learning the sounds that each letter and phonetic combination makes as well. 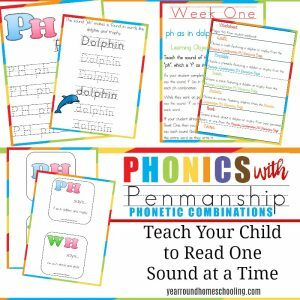 How well your children read, write and spell greatly depends on them learning phonics first, so do not skip teaching phonics to your kindergartners. When my children were ready to begin working on using the phonics they were learning through The Writing Road to Reading, we used the McGuffey Readers, the Primer followed by the Pictorial Primer. These simple reading books are a great companion to The Writing Road to Reading as they start with simple words that are easily sounded out with the use of the phonics your children learn through their phonograms. Throughout elementary school I used Rod and Staff’s Math curriculum, but they do not have a Kindergarten Math course. I wanted to include Math class in our Kindergarten homeschooling, so, I was excited to find a Kindergarten Math curriculum at a yard sale the summer before we began Kindergarten with my son. I prefer to see curriculum before I purchase it, so I was thrilled to be able to see what my son would be learning prior to spending money on a curriculum that I had never used before. Horizons Kindergarten Math is a fun curriculum that encourages your children to learn how to count, add, subtract and more with easy lessons for young students to follow. I was thrilled to discover that my children were able to complete all of their math problems without the use of their fingers like I saw many other children their age doing. One thing I did use to make completing math lessons more fun was candy! If you’re planning for a Kindergartener this homeschool year, I encourage you to remember that your children are little. Encourage them to love learning by allowing them to do the majority of their learning away from a desk and textbooks while they are still young. The future holds years of education and they will be more inspired to love learning throughout their lives if they are not pushed to grow up and do school too young! 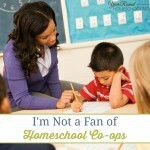 What are your favorite Kindergarten homeschool resources? I’m thinking to use ABeka for my daughter. Seems preferred by people i ask. I don’t plan to homeschool. But she has a late birthday so I thought to do a preschool or kindergarten course with her. 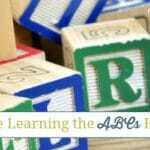 There are many homeschool families love using Abeka for their children. Make sure you keep preschool and Kindergarten a lot of fun, with lots of hands-on activities! I agree, we should keep loads of play and hands on activities for our preschoolers and kindergarten kids. 🙂 Playing is such an important part of learning and growing for our little ones! 🙂 Blessings Erin!